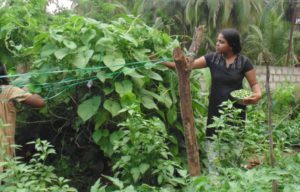 “We wanted 24/7 access to pure water, pure air, pure food and pure relationships along with love and satisfaction so we left our busy city lives and selected the village life. Here we have good support from nature hence life is extremely fulfilling,” shares Mr. Mohan Chavara Kalya, sculptor turned farmer and one of the founders of Thaithal village. It is being developed on 2.25 acres area collectively bought by 15 families. The green and scenic location of village is in Mannanur, Palakkad, Kerala. 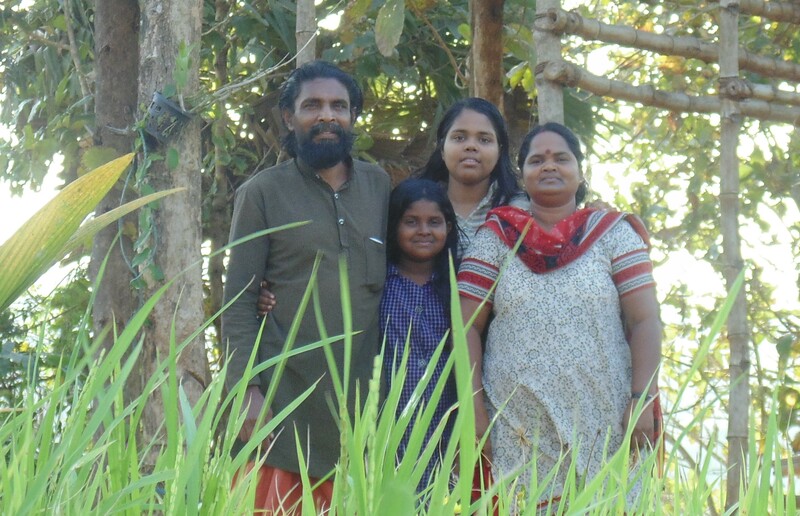 Mr. Mohan moved out of chaotic urban world in 2014 along with his wife, Ms. Rukmini and two daughters Surya and Sreya to set up community driven self-supported village. He took this route to natural and organic life with the support of 14 other like-minded families from diverse professions. Presently his family has initiated the change and other families shall join them soon. “They shall take some more time to plan their future properly and we have to give them adequate time for preparation. We want them to join us with free mind without any worries because hesitation and worries creates tensions that lead to annoyance. Every family would join the village with an open mind,” he asserts. The village is completely funded and supported by only these 15 families. “Nature has a rhythm of life. Every soul on this planet be it any organism is living according to that rhythm but in the name of ‘Development’ nature has been ruined quite a lot by human beings. Although we humans are gifted with many special skills and abilities than any other living organisms but we have lost the value of living life in harmony. Many people are competing with each other and degrading others for greedy survival. Also our precious natural resources are being handed over to corporates and we have to pay money for existence at every step. As a result, nowadays nobody lives life in peace and pleasure. 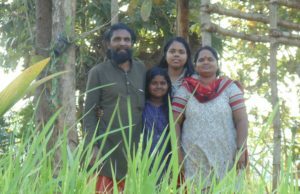 To be away from these circumstances we reached this concept of village as a part of living life full of love and simplicity,” Mr. Mohan describes the drive to establish Thaithal village. “Here we grow our food organically ourselves and there is no dependency on outside world. We have no written bylaws, everyone can speak, think and do the things freely without any inhibitions. The village is and shall run based on true or pure friendship. People with good and noble intentions can come and stay with us any time. Lastly, in the village there is no one leader instead everyone is a leader and also they are subordinates,” he lists the unique features of the village. 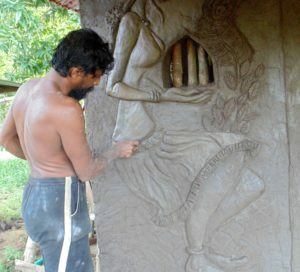 When asked about growing the food themselves, he says, “I am skilled to be a sculptor but belonging to the family of farmers all of us have the farming knowledge. We grow multiple crops in alliance with the climate conditions and ensure that what we grow makes a balanced diet.” The crops are selected for cultivation according to the season, availability of water and seeds etc. Few primary crops grown are paddy, millets, tapioca, groundnut, peas, green gram, black gram and Bengal gram while vegetables cultivated are brinjals, ladies finger, bitter gourd, snake gourd, tomato, chilies, spinach etc. 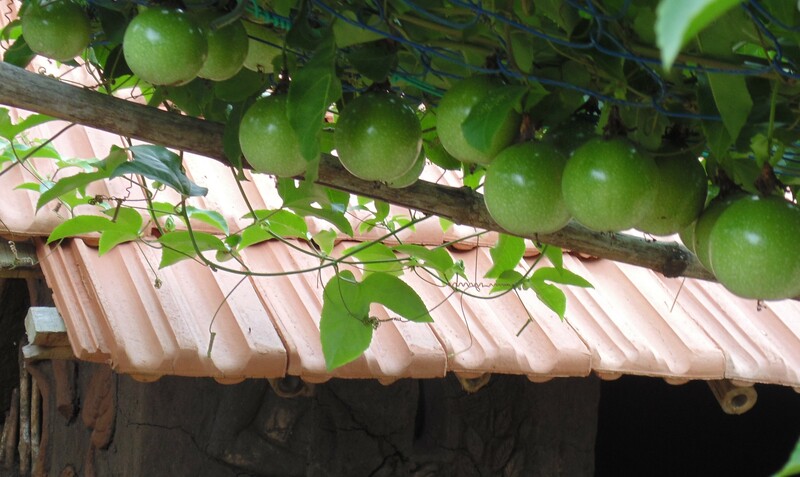 Fruit trees planted are passion fruit, rambutan, Indian goose berry, banana, mulberry, mangoes, jackfruit, rose apple, guava, pineapple and sapota. Seeds, fruit saplings, spices grafts and other planting materials were procured from ‘Krishi Bhavan’, VFPck, neighbors, friends and associate plant vendors. Prior to begin cultivation of these crops Mr. Mohan did soil and water testing because, “It is important to know the content of minerals and nutrients present in the soil. Depending on the deficiency of the nutrients we can feed the soil with specific nutrient rich compost. Similarly, water is tested to know its nature and accordingly the corrective actions are taken,” he elucidates. Desi breed cows are important for living an organic life hence there are two desi cows in the village as well as 27 poultry birds of two native breed varieties. 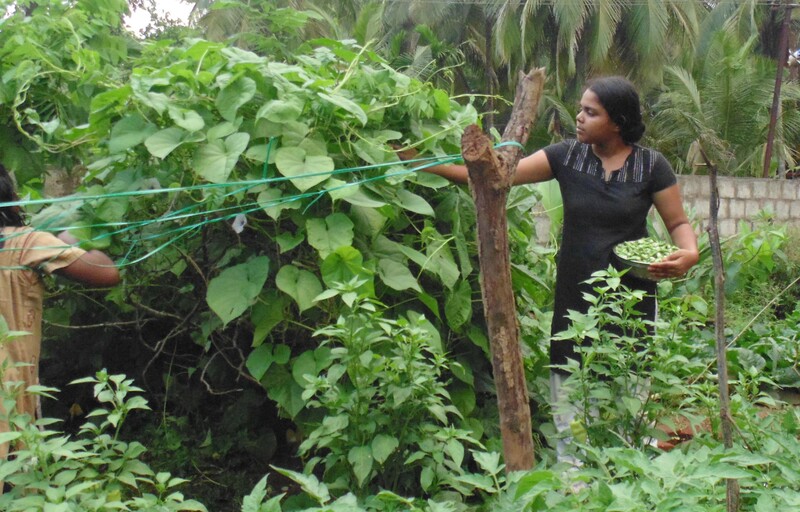 Farming is done only through compost prepared from desi cow dung, green leaves, poultry and kitchen waste. “We also prepare liquid sprays using desi cow urine and other natural ingredientssuch as neem leaves and seeds, garlic extract, green chili paste, tobacco etc. Using these biological agents in different combinations we are able to keep plants safe from pests and disease attack. We are strictly against the use of any type of chemicals in our village,” states Mr. Mohan. 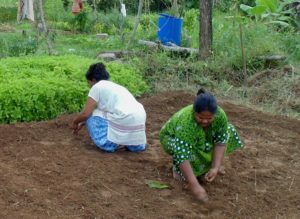 As organic farming is done in planned and organized manner in the village the production is always more than personal consumption. “The excess produce is sold as per the market price although it is 100% organic. Our next plan is to process the produce into value added products,” he shares. After moving to the village Kalya family is satisfied for the decision they have taken as they had made good friends and attained true relationships through which they believe to lead a successful life well supported by the nature. “In our life there is no obstinacy, disgust or rivalry. Most of the luxurious things are unwanted for us. We have achieved a good mental and physical health as there is not stress or tensions,” he highlights.